“We are broke in this state. The truth is we don’t have money to offer,” Walker says. 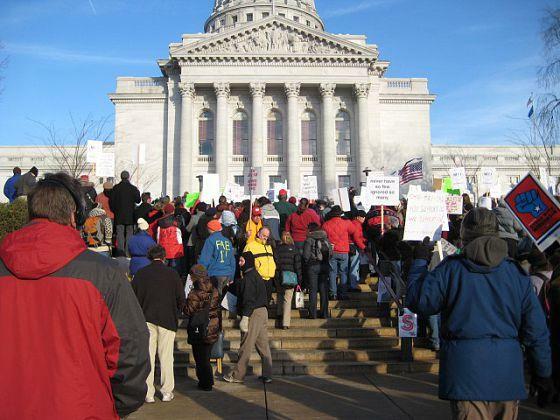 Demonstrations erupted, so did a bitter legislative battle, yet Walker signed Act 10 into law a month later. Public unions have felt the results. Kim Schroeder is president of the Milwaukee Teachers Education Association. He says hundreds of teachers retired, as soon as they could. Act 10 also forces public unions to re-certify each year and collect dues. Schroeder estimates MTEA membership at 70 percent of what it was, with some teachers reluctant to join. “We’re finding when we talk to people that there’s a perception of what a union is, a perception that’s been painted that we’re thugs, we protect bad teachers, that we’re greedy,” Schroeder says. Schroeder says Act 10 also changed the relationship between union and school district – the districts now write the rules. “We legally cannot bargain anymore, instead we go and do public testimony,” Schroeder says. Municipalities and their public workers have also felt the impacts of Act 10. Kathy Ehley is mayor of Wauwatosa. She says the absence of collective bargaining has allowed her city to find efficiencies. “Our staff came up with a system to reduce the number of employees that were needed to do garbage and recycling pickup,” Ehley says. Ehley says the overall effect of Act 10 is limited, because the law spares police and fire unions, and they make up 45 percent of Wauwatosa’s workforce. A lot of the savings also happened right at the beginning, according to Todd Berry of the Wisconsin Taxpayers Alliance. “The financial benefits of Act 10 are no longer multiplying the way they were. It’s not like you could keep switching plans and continuing to find savings year after year after year,” Berry says. The governor’s office estimates that Act 10 has saved Wisconsin taxpayers more than $3 billion. Another change it brought about was on the political landscape. Marquette University Political Science Professor Amber Wichowsky says public unions now have less of a voice. “Union revenue is down considerably as a result and their spending is also down quite considerably. In the legislative session before Act 10, WEAC spent just over $2 million. During the 2013-2014 legislative session, WEAC spent less than $200,000,” Wichowsky says. Membership in the WEAC – the state’s largest teachers union, has reportedly plunged by more than 50 percent, to 40,000 compared to when Gov. Walker first took office. He calls Act 10 a success story for taxpayers. “Absolutely. Local officials now can drive those decisions and respond to the people,” Walker says. Wichowsky notes there are whispers of Democrats moving to repeal Act 10, if they gain control of state government. She thinks a reversal would be difficult as government leaders have become accustomed to the new norm.